BAseball Reality Tour: What Will the Braves Do? What Will the Braves Do? The Braves had a terrible collapse last September. People outside of Atlanta don't hear much about it because (a) the Red Sox had a worse collapse, (b) the media loves to report on Boston teams, and (c) even Braves fans don't really care about the Braves. No team’s offseason transaction list reads with quite the sparseness of the Atlanta Braves’. Oct. 31: Trade starter Derek Lowe to the Cleveland Indians for a 23-year-old Class-A reliever and $5 million of salary relief. I've been thinking about the Braves for a few weeks, as a team capable of polarized results. They have a chance to perform as well as any other team on paper. They could conceivably win the World Series, or the Braves could finish in 4th place, behind the favored Phillies, and upstart Nationals and Marlins. All four of those teams will finish ahead of the Mets, who are decorating the NL East cellar, since they'll be there for at least a couple of years. For a few minutes, let's see what variables are hovering over Dixie's baseball team. What's up with Tommy Hanson's injury? We just saw Rich Harden go down for the year, on February 8th! At a time when shoulder injuries are proving over, and over, and over again to be devastating to pitchers' careers (see: Harden, Webb, Prior, Sheets), forgive us for being pessimistic about his "revamped delivery". We've heard about these new deliveries with Mark Prior many times. Forget it. The only two ways rotator cuff or shoulder capsul / labrum guys come back to have success is either in the bullpen, or as soft-tossing lefties. 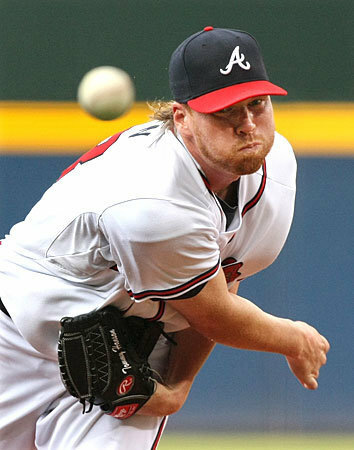 Hopefully, Tommy Hanson's shoulder issues are nowhere near this serious, as he's shown to be an outstanding pitcher..
For the 2012 Braves, staying healthy could be more challenging than usual, since it seems their top two pitchers are both banged up one week before camp breaks. In addition to Hanson, Tim Hudson may not be ready for the start of the season. Much of the hopes of Braves fans, though, comes in the next wave of pitchers due in from the minor leagues. Their top 3 pitching prospects: Arodys Vizcaino, Julio Teheran, and Randall Delgado should be able to help the Braves out of the bullpen or as starters. Baseball Prospectus and Baseball America have these guys as the Braves top 3 prospects overall. ESPN's Keith Law snuck catcher Christian Bethancourt ahead of Delgado, he had all 4 of them in his Top 100 prospects in baseball list. Some of the Braves' greatest weapons last season were in their bullpen. In fact, as a team, the Braves' bullpen led all of baseball in Opponents' Batting Average, ERA, FIP, xFIP, and SIERA. Braves' fans should have confidence in their bullpen entering this Spring, but there are question marks due to the 2011 high workload of their best relievers: Crag Kimbrel, Johnny Venters, and Eric O'Flaherty. Those three pitchers were league leaders in IP last season, each throwing over 73. Extend the group to include Cristhian Martínez, who threw 77 innings for the Braves and another 22 as a starter in AAA, to see that over half of the Braves bullpen will try to bounce back from a heavy workload. 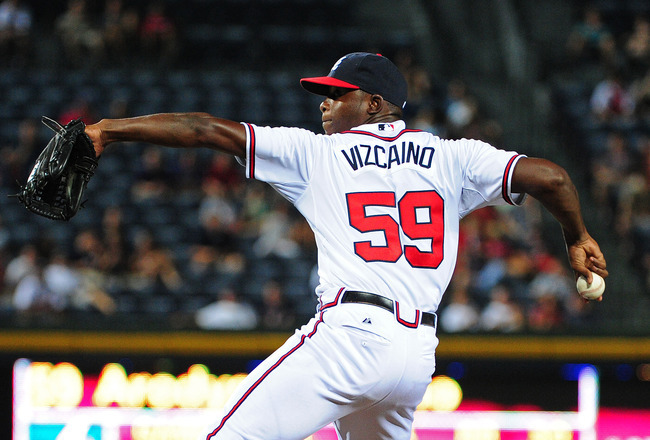 love to have Arodys Vizcaino back. These factors show the potential for feast or famine this year in Atlanta. They have the players to succeed, but also serious red flags. What should provide substantial hope is that Vizcaino, Teheran, and Delgado could also step in to fortify the bullpen as attrition takes its toll. What is Jair Jurrgens value? This homegrown* player could be traded midseason, but the Braves would have to lower their asking price substantially, by falling out of the race. Or, Jurrgens is going to have to pitch like Tim Hudson, and even then the Braves will have to fall out of the race. It may play out that the Braves should have tried to roll the dice on a Jurgens trade this offseason, getting less in return, but something that could help out in more ways than one. *still kindly accepting applications for editors. How much will simple regression get Jason Heyward out of his Sophmore slump? How great will Jason Heyward be if his health and growth make him a better player than in 2010? Does Chipper Jones have another "one more year in the sun"? In a shocking turn of events, as he ages gracefully, Larry is slowly becoming less and less irritating. McCann and Freeman are great, but will McCann start to show his backstop mileage? And, will Freeman be able to avoid the sophomore slump monster that swallowed the J-Hey kid last season? The smart money is on both of these guys to continue succeeding in the heart of the order. Dan Uggla provides rare power from the keystone position. Will Uggla avoid enough outs to keep the Braves competitive? Will his defense be a problem the team cannot overcome? *I wonder if this could launch an internal investigation. Hmm, NERD ALERT, who has made the most outs with his glove and bat combined? The Braves signed Jack Wilson, but the general feeling around the Braves is that he's there as a backup / mentor / defensive replacement. Tyler Pastornicky will be given every opportunity to win the starting job. His ceiling seems relatively low, however. Not meaning to short change Pastornicky, but he failed to impress with the bat during his brief stint* last season. He hasn't shown any power and his 77% success rate stealing bases in the Minors is no more than "good". Really, not trying to speak badly of Pastornicky, but there must be reason he doesn't come with the buzz of guys like Manny Machado or Jurickson Profar. There are a lot of exciting shortstop prospects, and frankly, I'm not sure Pastornicky is going to be better than the player he is replacing or another rookie shortstop in the National League: Zack Cozart in Cincinnati. *The highest of apologies for referencing a cup of coffee that never took place. If you've gotten to this point, you are likely a huge Braves fan, one of my friends/family, or perhaps you're having a stroke. There was very little math used in this exercise. Please feel free to enlighten me and other readers with more intelligent comments below.